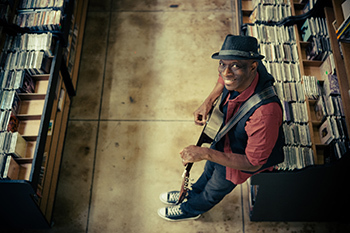 Three-time Grammy award-winning singer, songwriter, guitarist and contemporary blues artist Keb’ Mo’ will perform live in concert at Gala 2015, Syracuse Stage’s major annual fundraiser. The event will take place on Friday, June 19, in Goldstein Auditorium in the Schine Student Center. Tickets for the concert will be available March 1 at the Syracuse Stage Box Office, 315-443-3275 and online. Seating is general admission in the balcony. Doors will open at 8:45 p.m. and the concert will begin at 9 p.m.
Tickets for the entire gala event include cocktail reception, silent auction, dinner and concert, available now at 315-443-2709. Keb’ Mo’ has cultivated a reputation as a modern master of American roots music through the understated excellence of his live and studio performances. His songs have been recorded by B.B. King, Buddy Guy, the Dixie Chicks, Joe Cocker and Robert Palmer, and his playing inspired leading instrument maker Gibson Brands to issue the Keb’ Mo’ Signature Bluesmaster acoustic guitar. He has collaborated with Bonnie Raitt, Jackson Browne, jazz diva Cassandra Wilson, Buddy Guy, Amy Grant, Solomon Burke and Little Milton. He also performs the theme song for thesitcom “Mike & Molly” and was music director for TV’s “Memphis Beat.” More information about him is available at http://www.kebmo.com. Syracuse Stage Gala 2015 is presented by the Syracuse Stage Board of Trustees and Syracuse Stage Guild. Bea González, current trustee, former board chair and dean of University College, will be honored with the 4th Annual Louis G. Marcoccia Award for Exemplary Service to Syracuse Stage. Gala honorary chair is Louis G. Marcoccia, president of Syracuse Stage’s Board of Trustees. Event co-chairs are Robert Pomfrey, chair, Syracuse Stage Board of Trustees, and Jacki Goldberg, Syracuse Stage Guild Board. Underwriter for the event is the POMCO Group. All proceeds will benefit Syracuse Stage artistic and educational programming.